Spring has sprung, and that's cause for celebration... and by celebration, we mean the first Fat Kid Friday of the Winter thaw. Rejoice accordingly: Nothing says, "I missed you, Sun!" like tackling an 18in, cheese-stuffed corn dog and a pizza-topped Bloody Mary. Your bikini bod is screwed. 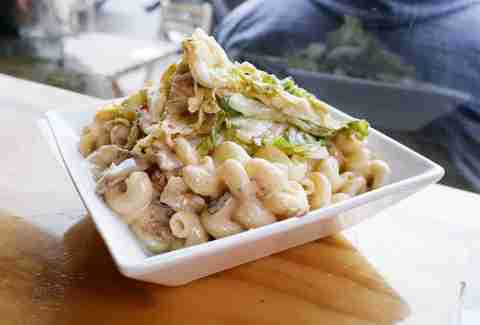 In a city that nonchalantly rolls out vegan mac & cheese (what does that even mean?! ), we appreciate a subtler addition of vegetables to one of our favorite indulgences... like kimchi. Since the word "cabbage" isn't even in our vocabulary, we like to be unaware that we're eating it (except when paired with "patch" on the dance floor). Oh, and there's blue cheese, cheddar, and bacon noodles, too. See, vegetables are awesome. Clearly, PYT’s moms neglected to tell them to stop playing with their Kid Cuisines, or this monstrosity would’ve never been made. 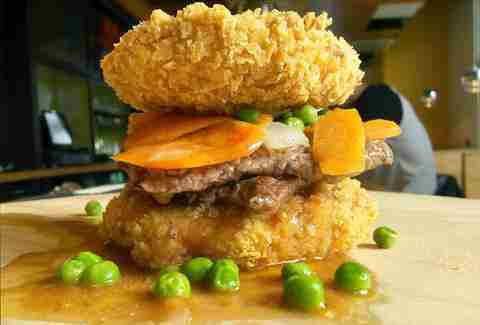 What look like massive tater tots -- they're really deep-fried mashed potatoes -- sandwich two Salisbury steaks, plus a veggie medley and gravy. Our fingers are crossed that the tiny TV dinner brownie comes later, and Nick at Nite is showing Golden Girls in the background. Few things feel as satisfying as stuffing one’s mug with heavy beer and deep-fried food while watching ridiculously fit men perform athletic feats we can only dream of. But since it's baseball, you'll have to settle for expensive cheap-beer and doughy men. 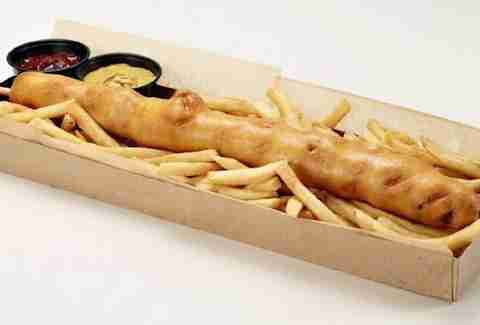 Thank goodness, then, that the Arizona Diamondbacks are upping the stadium-food game with an 18in-long corn dog stuffed with cheese, bacon, and jalapeños. It comes with fries, obviously. 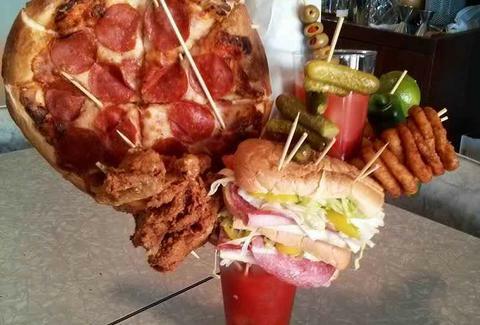 A healthy, boring person once told us to stop drinking our calories, and to that person, we raise this Bloody Mary that'll let us eat a solid 4,000+ calories just so we can drink. Actually, we can't toast with it, because it’d probably fall over. 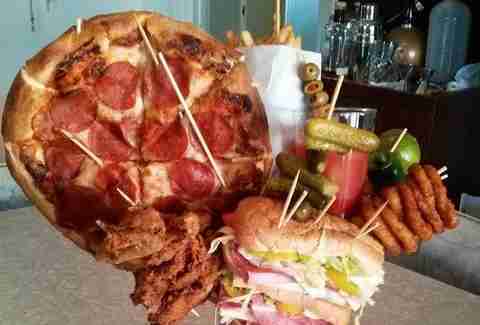 But we sure can flaunt the concoction in all its foot-long sub/pizza/fried chicken-topped glory. Cheers, Spring. Please don't kill us. Liz Childers is a food/drink editorial assistant at Thrillist and would like to formally ask Mr. Liedtke to be her best friend, since his drink combines all of her favorite foods. Follow her declarations of love at @lizchilders1.